Our new and innovative women’s Performance hoodie features an 80/20 blend which lends a remarkably soft, smooth and comfortable fit and feel to this contemporary yet functional hooded sweatshirt. A split, reinforced and flat-stitched kangaroo pocket at the front, with full zip and drawstrings at the neck, compliment the single-layer hoodie, giving this sweatshirt a stylish yet modern and functional fit. 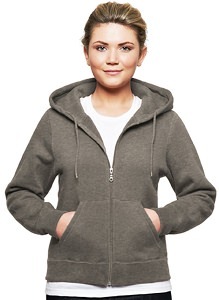 Available in a variety of colors, each of our Ladies Hooded Zipper 80/20 sweatshirts feature a carefully crafted design perfect for everyday life and every wardrobe.